On the first day of the new year the Government issued Resolution No 01/NQ-CP/2019 for the robust development of the securities market, especially the derivatives segment. In 2018 the VN-Index was down 9.3 per cent, which created an opportunity for the derivatives segment to come into its own. 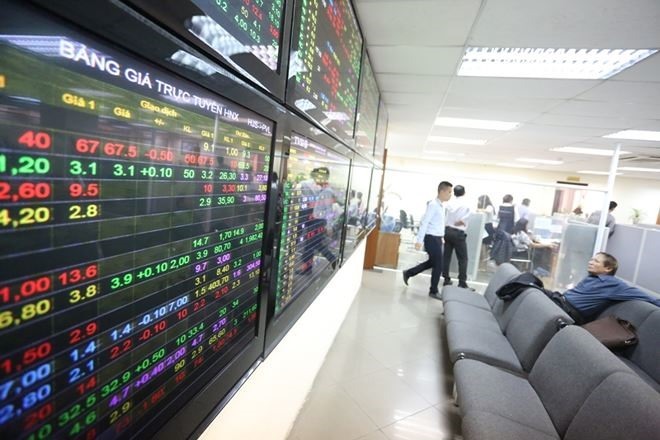 Officials from the Hà Nội Securities Commission (HNX) said the derivatives transaction numbers averaged 78,800 per session, seven times higher than the number in 2017. The open interest numbers were consistently rising, reaching 21,635 contracts by year-end, 2.7 times last year’s figure. Open interest is the total number of options and/or futures contracts that are not closed or delivered. Experts said the main reason for the derivatives market’s strong growth last year was the slowdown in the basic securities market. Trần Văn Dũng, the chairman of the State Securities Commission of Việt Nam, told Đầu Tư Chứng Khoán newspaper that in 2018 the Government’s standing committee, for the first time ever, had to meet to discuss measures to improve the situation since the Vietnamese securities market came into being 19 years ago. With little money to be made in stocks, investors increasingly switched to the derivatives market. This also had a positive impact on the basic securities market since investors no longer had to bargain away their stocks. Some experts even believe that the fall in the VN-Index was contained at 9.3 per cent thanks to the growth of the derivatives market, and could have been worse without it. Analysts said derivatives have become an important tool for investors to hedge risks, and this also explains why the Government expressed determination to develop the derivatives market in its recent resolution. However a lot of things need to be done to develop this market, according to experts. There are three big problems in the securities that need to be addressed first, one of which is the lack of institutional investors. Institutional investors include banks, insurance companies, pensions, hedge funds, REITs, investment advisors, endowments, and mutual funds. Now 99 per cent of those participating in the derivatives market are retail investors. This is different from other countries where a majority of derivatives market participants are institutional investors. This is one the reasons delaying the launch of a derivative product in government bonds, also called g-bond futures contracts. But Việt Nam still lacks a policy framework to develop institutional investors. Another problem facing the derivatives market is that it has only one product — the VN30-Index futures. The VN30-Index captures the performance of the top 30 largest stocks on the HCM stock exchange in terms of market value and liquidity. But the limited number of stocks on the HCM stock exchange reduces the possibility of launching new products. Yet another problem is that Việt Nam still does not offer investors tax and other incentives as many other markets did in their initial stages of development. This problem can be resolved only by the Government and National Assembly, the experts said. The Hồ Chí Minh Development Commercial Joint Stock Bank (HDBank) has earmarked a preferential credit package worth VNĐ10 trillion (US$440.53 million) for those involved in hi-tech and clean agriculture around the country. Loans in the package carry interest rates that are 1 per cent lower than on normal loans, and borrowers can use assets created with the loans as mortgage. The tenor of the loans will be up to 10 years. HDBank said the package was aimed at fostering the trend of individuals and businesses wanting to invest in the production of green products to meet the increasing demand. It said all enterprises that wanted to develop new agriculture projects using high technology can get loans under this programme. HDBank also had special financial solutions to enable the enterprises to directly supply consumers with their clean agricultural products and for exports. Not only HDBank but also many other credit institutions are beginning to focus on eco-friendly projects, green products and services and clean and renewable energy with an eye on sustainable growth. NamABank recently signed an agreement with Global Climate Partnership Funds – CCPF to carry out a green credit programme to lend to projects that are friendly to the environment and society. The lender’s general director, Trần Ngọc Tâm, told Sài Gòn Giải Phóng newspaper that climate change and environmental pollution are some of the world’s biggest problems, and so his bank would like to give a helping hand to build a green environment and sustainable society through this programme. Other banks such as Vietcombank, Agribank and Vietinbank have also earmarked considerable amounts of money for lending to renewable energy projects. According to analysts, in recent years the banking sector has made some adjustments to their credit flows to align them better with the Government’s green growth goal. This is clear from the fact that the banking sector’s outstanding green finance loans have kept increasing: from VNĐ 180.12 trillion ($7.93 billion) in the last quarter of 2017 to VNĐ235.72 trillion ($10.4 billion) in the third quarter of last year. The banking sector is thus playing a significant role in green investment and directing credit to eco-friendly sectors. Their credit policies, which prioritise environment-friendly products, are encouraging borrowers to implement green projects rather than those that have a deleterious effect on the environment. But other experts said the banking sector’s green lending was quite limited when compared with loans to other sectors, particularly real estate, which amounted to VNĐ471 trillion ($20.75 billion). The State Bank of Việt Nam said only 24 green projects had so far this year interested banks. Besides, the green loans were given mainly in agricultural and rural areas, it said. The experts pointed out the reasons for the banks’ moderate green investment, one of which was that bankers were still afraid of bad debt risks. According to an executive at a commercial bank based in HCM City, since green projects take long to break even, are costly and come with high market risks, the bad debt risks are high. Technical assessments of eco-friendly technology projects are also very complex and this is another reason for banks to be wary about lending to them. The spokesperson for the International Finance Corporation in Việt Nam, an organisation dedicated to helping the private sector within developing countries, said in Việt Nam banks’ lending to green projects still faced many difficulties because of the lack of a proper legal framework. Banking industry insiders said to encourage banks to invest in eco-friendly technology projects the central bank should allow them to use short-term deposits for long-term loans. They should also be given refinancing and rediscounting preferences and allowed to reduce the compulsory cash reserve ratio if they lend to green projects. The cash reserve ratio is the percentage of deposits banks are required to maintain in cash with the central bank. Experts said to effectively develop green credit, banks had to spend a considerable amount of money on building a social and environmental risk management system and providing professional skills training to their staff.